I have to say there isn't a lot of good bridle work on the market these days and some of the bridle work available is just badly designed and just not comfortable and is made using poor quality leather. In general if you buy inexpensive leatherwork it will not last or look smart for long and in some cases may be unsafe to use even when new. Also there are not many padded Bridles available that actually fit well have a good variety of sizes and are cut away in the right places I do like the Micklem Bridle which is well designed and carries a Drop Noseband. You just need a well fitted well made good quality Bridle to have your Horse comfortable. Which width you choose should be dictated by the make and shape of the Horse or Pony you are riding. 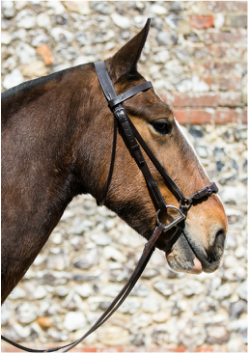 For instance for the neat small head of a Lead Rein Pony or a Show Pony or an Arab you may consider ½” Bridle work as thicker heavier Bridle work will look too clumsy and detract from a pretty face. For a larger Pony or small Horse 5/8” Bridle work will look much better and more in proportion. A Large Hunter or Cob type could have ¾” Bridle work as such a substantial Horse would look out of proportion in narrow Bridle work.